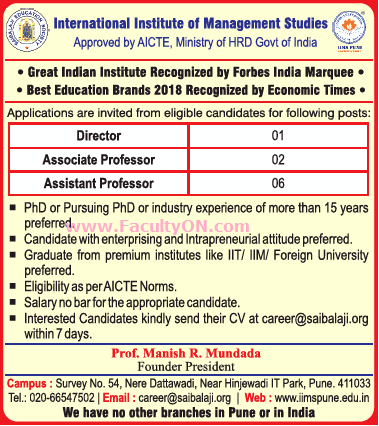 International Institute of Management Studies, Pune has advertised in THE TIME OF INDIA newspaper for the recruitment of Director / Associate Professor / Assistant Professor Plus Non-Faculty jobs vacancies. Interested and eligible job aspirants are requested to apply within 07 days from 25th July 2018. Check out further more details below. About College: International Institute of Management Studies is a B School with a difference. A Management Training Institution that believes in working 24x7x365 to procreate dynamic managers. Ph.D or Pursuing Ph.D or Industry Experience of more than 15 years preferred. How to Apply: Interested and eligible candidates are requested to send application along with CV, copies of certificates / mark sheets and recent PP size photos to the following email address.